Is your company or organisation interested in supporting engaging and critical public discussion in Manchester? The Manchester Salon discussion forum hosts public debates on contemporary political, cultural and scientific issues. It aims to capture the essence and contemporary nuances of the subjects or topics discussed, and challenge some orthodoxies along the way. The events are informal and open to all; with writers, academics, politicians and experts in their fields presenting ideas to help spark informed and robust discussion. Since May 2008 the Salon has hosted over 80 public discussions on issues such as understanding the recession, drugs policy, congestion charging, assisted suicide and development in China; and have co-hosted debates with the Institute of Ideas, Institution of Engineering and Technology and Manchester Science Festival - see Battle of Ideas satellite. In 2010, we introduced the Reviews section of the website to help participants develop their writing skills by trying to capture the mood of what’s changing in and around Manchester in particular, through a focus on books, film, theatre, music, lifestyle and food. The reviews section has been invaluable in situating the Manchester Salon more centrally in the intellectual and cultural landscape of the North West. In 2011, we’re building on our success. Firstly, we’ve introduced the monthly ‘First Tuesday’ discussions - focussed on responding to events in the news, and aimed at developing some new journalistic and ‘talking head’ personalities – citizen journalists with intellect and attitude. Secondly, we’re looking to extend our collaborative activities to host more joint discussions with subject focussed specialist groups to facilitate a critical dialogue between subject specialists and society more broadly. In addition to the website, we have an opt-in mailing list and a Facebook group increasing the Salon’s touch points. Our audiences are drawn from local students and young people, academics, politicians, journalists, writers, bloggers, cultural entrepreneurs, and public intellectuals. Our Press Releases are written and sent out by Manchester news editor and PR man Dave Porter. 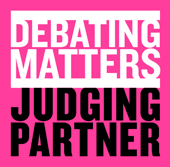 Establish your organisation's commitment to open public debate in Manchester and the North West by sponsoring an individual event around a subject of particular concern, or demonstrate your organisation's support for open public debate across a wider range of subjects by sponsoring the Manchester Salon for a year. Details of both packages are included below. To download a version for use within your organisations, click on this Word or PDF link. We will display your organisation or company logo on our website for a minimum period of 12 months. We’ll also provide a keyword rich link back to your own website. We will produce a Manchester Salon pop up banner for use behind the speakers’ table which will include your organisation or company logo as sponsor. Your organisation or company logo will also appear on our Email notifications for the same period. This includes two invitation Emails sent out to advertise each Salon (an initial invitation plus an RSVP reminder). Your company name will also be listed on our Facebook group, and will appear as part of the wording for every event advertised through the Facebook group for the same period. We will mention your company ‘in thanks’ at the end of each Salon discussion. At those events where we charge an entrance fee on the door, there will be free entry for your organisation’s members or company’s employees. We will display your organisation or company logo on our website for that particular discussion from the moment the event goes live on our website. You company logo/name will then remain as part of that archived event. We’ll also provide a keyword rich link back to your own website. Your organisation or company logo will also appear on our Email notifications for that event (an initial invitation plus later RSVP reminder). We will mention your company ‘in thanks’ at the end of that Salon discussion. If you’re interested in sponsoring the Manchester Salon contact Simon Belt by completing this Sponsoring the Salon application form.